Flotilla is a gorgeous range of plug-and-play electronics for the Raspberry Pi from Pimoroni. We backed the Flotilla project on Kickstarter and wrote a first impressions review once we'd had chance to play with the kit. It was early days and some things weren't quite ready (all perfectly normal for a crowdfunded project!) so we promised to return in future. We've got the Flotilla kit out again and in this post we'll take a look at the Cookbook aspect of Flotilla. The Flotilla Cookbook is a series of browser based projects where the software is pre-written and you just have to plug in the correct modules to the dock. We have the full Mega Treasure Chest which means we can create all of the Cookbook projects. There are now 11 of the originally promised 20 projects available online (with more to come) so this gives us a much better idea of the Cookbook concept and plenty of projects to get started with. Some of the projects make use of components that are included in the Mega Treasure Chest including wheels, laser cut parts and cardboard cut outs. It's a neat idea to have projects that allow kids to use the electronics modules immediately and understand what they do. The first project is a balance game, but my kids found it too hard and confusing to work out what was going on. They quickly moved to the bat and ball game which is a two-player game using a slider and dial. It says that the first player to 10 is the winner, but the scoring is backwards and the first player to 10 is actually the loser. Again the kids found the game hard to play. We found that some of our modules have really sharp points of solder so be careful of that when playing with them. We've tried two of the Cookbook projects with a physical making element, the Mood Light and the Line Following Car. The first physical project we tried was the Mood Light. This uses a laser cut acrylic base to which you attach the Rainbow LED module and slot in cardboard parts. The light can be controlled by the touch pad module or set to automatic mode. This is a lovely project which my younger son really enjoyed. It's a shame that the instructions were printed on the back of the card as they can be seen in the finished project. But it's a nice simple project with just two plastic nuts and bolts to attach. We loved the plastic nuts and bolts, much easier to work with than the metal ones that we're used to. The line following robot is the most complex make and has a video tutorial to show you how to make it. It uses every long bolt in the pack so we'll have to be really careful not to lose any. LEGO style step by step instructions would have been helpful. The assembly was fairly straightforward but hard to follow as a video so I had to help my eight year old quite a lot. The interface doesn't have any explanation but you can change the colour of the rainbow LED that shines underneath the robot. We didn't have any luck with the red or green colours, but with blue the robot slowly followed the line. My eight year old had the idea of shining a bright torch at the robot, this worked really well and it followed the line much faster. Note that you have to keep the Flotilla attached to the Pi via USB while using it but the cable is quite long so this is okay. The Cookbooks projects are nicely done and give kids an idea of what is possible. We really like that physical parts have been included to get you started. 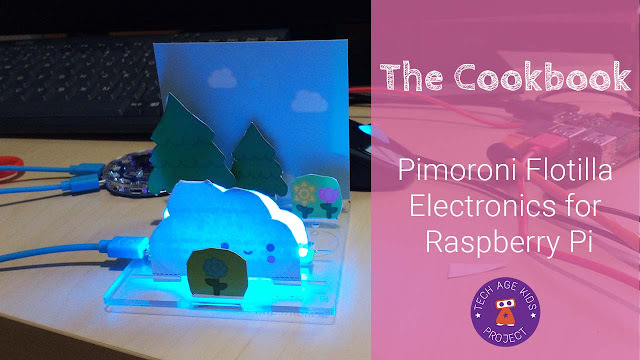 It can be hard for kids to imagine what they could make with electronics modules without seeing some examples first. The mix of card craft, laser cut parts and electronics works really well. The screws will be a bit tricky for younger children and make it feel like a bit of an effort to take projects apart to build new ones rather than just slotting things together. The USB cables aren't exactly subtle and tend to dominate projects. Overall though the approach is much simpler than working with the Raspberry Pi GPIO for beginners. 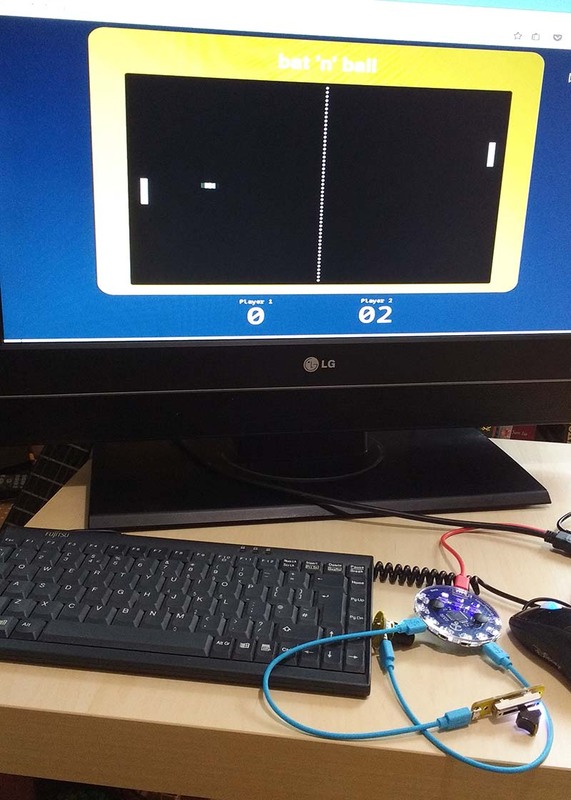 Quite a few of the projects could be done using a learner electronics board such as the Circuit Playground or BBC micro:bit which is more convenient and a lot cheaper. But the range of modules in Flotilla is impressive and it can be convenient to be able to build projects where the individual modules can be positioned as you want them. The Rockpool interface doesn't allow you to create projects that have a user interface on the Raspberry Pi (which all the Cookbook projects do.) You can program Flotilla with Python but the examples are minimal and nothing like the Cookbook projects. We will look at programming Flotilla with Python but it would be hard for kids to get started on their own. 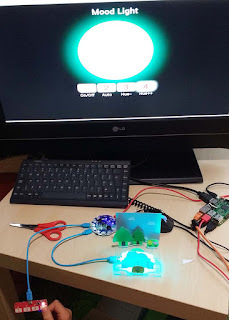 My kids know a bit of Python from programming Minecraft on the Raspberry Pi but will need a lot of help to get started with programming Flotilla. We're also going to take a look at the node-red support for Flotilla. Flotilla works well for a family with mixed ages as younger children will enjoy the pre-canned Cookbook projects while older children can start programming the modules. You could also use the Cookbook projects with a younger child and then have lots of capability for them to grow into as they get older and learn to code.